If your partner ever turned into a maniacal harpie intent on destroying your world, you have something in common with the X-Men's Cyclops. 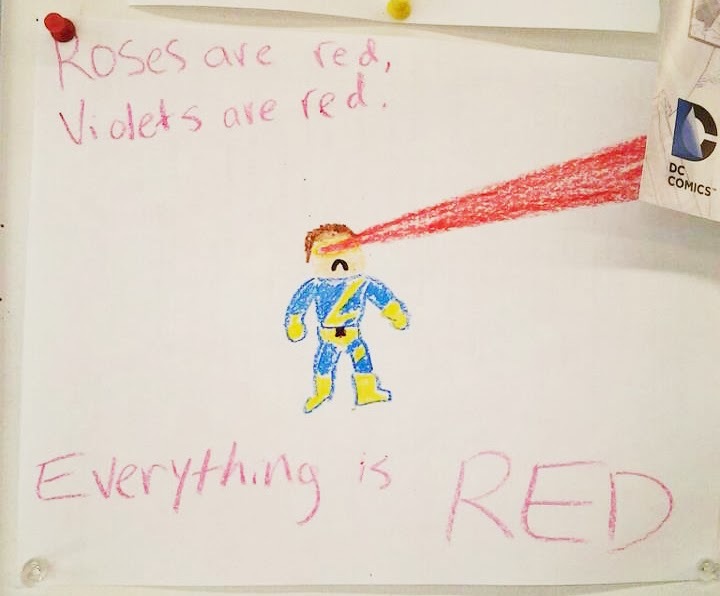 Not content with yesterday's news his younger self is getting his own series, in this kid-like drawing, Scott Summers takes a spin on the usual mutant Valentines Day poetry - and then takes aim at DC Comics. Yip folks, everything is red. Well until it's Easter. Then it's I'm-never-eating-chocolate-again-arine. Still, so I don't become the Valentine's Day version of the Grinch, here's the latest trailer for Sony's The Amazing Spider-Man 2. That series is hilarious King! Have you seen the Angel one? That's my pick. 'Bird!' I haven't watched Cyclops before, it it was just as good. Thanks for postin'! Yup, I'm a Pete Holmes fan- I've seen them all from his show... The Gambit one is my favorite. "Yeah- I throw it. I throw it REALLY HARD!"